The Biggest challenge after creating Facebook Fan-Page for your brand is to actually acquire Fans (Likes) that have interest in your brand or build your Brand interest among people. While to build this audience Facebook provides advertising schemes, these schemes might cost a lot. The easiest way to get fans that all the Admins or Social media service providers follow is to just Invite your own friends. Yes you can do this, but you have to send invites to your each friends individually by clicking Invite button for each. [ * ] This tricks only if you are the Admin of the Fan-page. 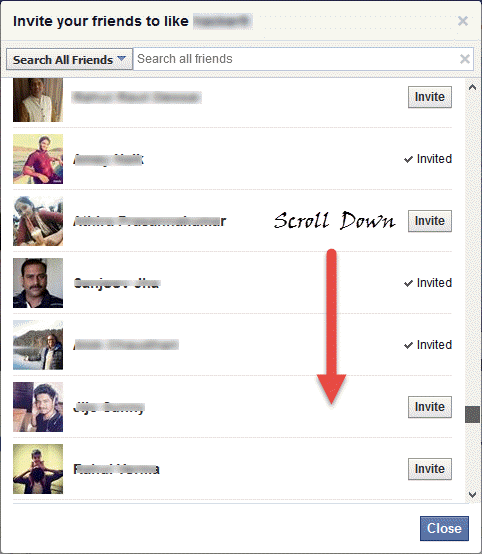 A new window will open up Which will list all your Friends along with Invite buttons inline with the friends name. Just Scroll down till your reach end of the list or till it stops loading. Now Press F12 Button on your Keyboard to open up developer options. Now sit back and relax. The Script will automatically click Invite buttons on behalf of you and within few seconds you will see that you have successfully invited all your friends to your Fan-Page. If you face any problems or have anything to say, just write in as a comment below and will revert back asap.